January 22nd in Wordpress Plugins by Wordpress Jedi . Anybody who uses a highly customized WordPress theme knows the importance of using a child theme. Creating a child theme is pretty easy in most cases. You don’t need to be a PHP coder or an experienced designer to get it done. 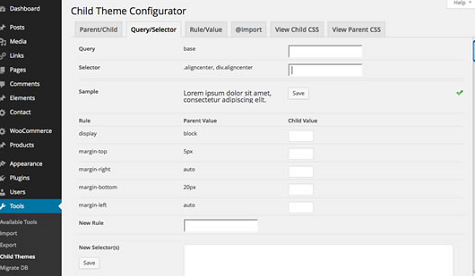 Child Theme Configurator is one of many plugins you can use to create and customize your child theme easier. This plugin lets you customize your themes without having to worry about losing your changes. The plugin lets you change colors, backgrounds, fonts, and everything else. 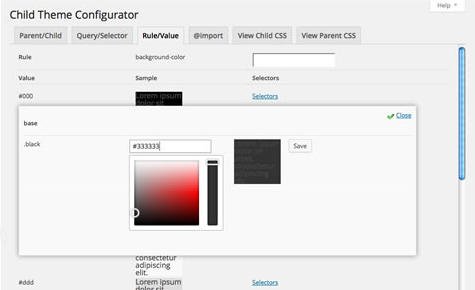 In fact, it lets you identify and override individual CSS selectors from the parent theme. You will be able to view style changes before pushing them live. Users have the option to import web fonts and export child themes as a zip file. Child Theme Configurator is designed to make it easier for you to customize your theme without having to worry about losing your changes after each and every update. Even if you are a CSS master, this plugin can save you time. It is available for free.